Spuma is a traditional Tuscan nonalcoholic beverage. It is a soft drink, very similar to a soda. 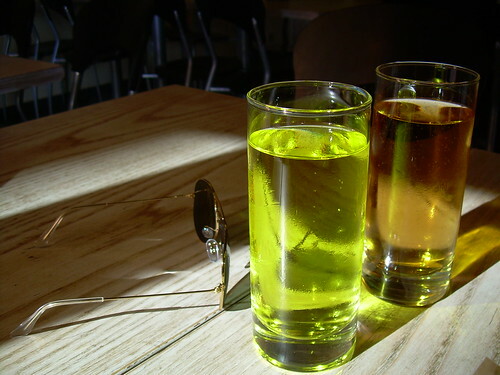 There are two kind you can choose from, one is called spuma bionda, which is blond in color and it tastes like a ginger ale, the other is called spuma al cedro which is green in color and it tastes like a citrus soda. It used to be the favorite soft drink choice, inexpensive and locally made, nowadays unfortunately replaced by the globalization of Coca Cola brands. However, you can still order spuma in every coffer bar in Tuscany. It is a drink that everyone enjoy, from kids to adults. Old men playing cards at the bar usually top off a glass of wine or beer with some spuma, calling it miscela. It is a great alternative of water and it is a very popular drink during hot summer days. Spuma is one of the greatest and most traditional soft drinks deeply rooted in our culture. It is highly addicted (I remember as a kid, drinking it by the liters and not even realized that) and probably not the healthiest beverage on earth but I strongly suggest to order, one or two glasses when you are in a coffee bar (simply called bar) in Tuscany.